Plain labels are produced in both rolls and sheets using many of our stock dies. They are suitable for use in Thermal Transfer, Direct Thermal, Inkjet printers and many other applications and are available in Permanent, Removable, Freezer and Marine Grade adhesives. 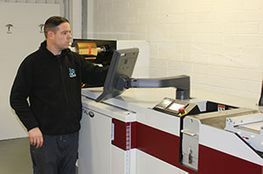 We offer a full printing service and can produce any labels from 1 up to 6 colours on our Conventional UV Flexo Presses. These labels can be printed in roll form or sheets on all substrates both adhesive and non adhesive and we can also back print or adhesive print to suit your individual requirements. Printed labels can be produced using our Digital one press and we can print up to 5 colours or a combination of full colour with cold foil or lamination. This is ideal for customers manufacturing multiple items requiring small quantities. NO PLATES ARE REQUIRED in this process providing huge savings on origination. 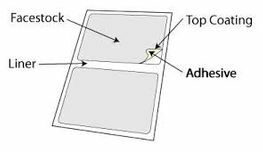 We stock a wide range of sheeted A4 Labels which are compatible with all of today's leading computer software packages. A range of Thermal Ribbons in Wax Wax/Resin and Resin is available to suit all printer types, Both Flat Head and Near Edge and prices available on request. In addition to this we provide a Bureau Service for your variable data, Barcode and Sequential numbering should you have an urgent requirement. For any company whose business is built on prompt despatch and delivery, Self Adhesive Document Holders are essential. Self Adhesive paper tape, widely used for packaging purposes and compatible with the majority of modern application equipment.